The Falange Española was preceded by several similarly oriented organizations which favored a corporate state, nationalism, and respect for tradition and social justice, while vigorously opposing parliamentarianism, class struggle and the money power. One such group, the Partido Nacionalista Español, was founded in 1930 by a neurologist named José María Albiñana and patterned after the French Camelots du Roi. Violently nationalist and authoritarian, it introduced the Roman salute into Spanish politics. In 1932 it was reorganized as the Spanish equivalent of the movements of Hitler and Mussolini, but it supported the monarchy and religion. Repeated arrests of Albiñana kept his party in the small-fry category. Meanwhile, another young crusader, Onésimo Redondo Ortega, who came from a family of peasants and priests, was organizing workers in his native Castille. His experience as a lecturer in Mannheim, Germany, had acquainted him with National Socialist thought, which he attempted to reconcile with his own intense Catholicism. Youthful, vigorous, handsome and passionate, Redondo was obsessed with three goals: national unity, the primacy of traditional Spanish values and social justice. In June 1931, he founded the weekly Libertad. A few months later, Ledesma and Redondo agreed to combine their efforts and launched the Juntas de Ofensiva Nacional Sindicalista (JONS), the first Spanish National Syndicalist organization. What JONS lacked in coherent ideology, it made up for in enthusiasm and spirit. While the Jonsistas chose the yoked arrows of the Catholic kings to symbolize their goal of a restored Spanish empire, Ledesma coined the slogan Arriba! The group also adapted the red-black-red anarchist banner to signify its radical aims. All of these trademarks of National Syndicalism would later be adopted by the Falange, and even today they are still recognized as official symbols of the Spanish state. Ledesma and Redondo worked poorly together, so JONS made only limited progress in its first two years of independent existence. The two leaders had little understanding of practical or tactical questions and failed signally to make their ideology attractive to the general public. The birth of the Spanish Republic in 1931 brought disarray to the nationalist Right. The middle class wanted neither to accept the new political realities nor to return to the past. The Confederation of Autonomous Rightist Groups (CEDA) was organized around the conservative Catholic Action and led by the uninspiring José María Gil Robles who could not rouse the dissident students, bourgeois and workers to recognize him as an alternative to the lackluster conservatism of the traditionalists and the antinational and antitraditional forces of the Left. It was at this crucial moment that José Antonio Primo de Rivera made his dramatic entrance into politics as a man of the Right. Born in 1903 in Andalusia of an upper-middle-class family with a long tradition of military service, José Antonio differed sharply from his father, General Miguel Primo de Rivera, who ruled Spain from 1923 to 1930. Whereas the latter had been a sensual, jovial Babbitt, José Antonio was modest, serious and given to intellectual pursuits. Educated in literature, modern languages and the law, he was, among many other things, an amateur poet, especially fond of Kipling. José Antonio was an excellent student at the University of Madrid, where he dabbled in student politics. Despite his background, he favored the liberal faction, but was careful not to become too involved in too much political activity during his father’s rule. Emotionally, though not politically, attached to the General’s career, he could not help being dismayed when his father’s supporters forced his resignation after he no longer served their interests. As time went on, he found himself agreeing with his father’s scorn of politicians, the liberal intelligentsia, parliamentarianism and middle-class democracy. In 1928 and 1929 José Antonio developed a serious interest in politics and began studying Spengler, Keyserling, Marx, Lenin, Ortega y Gasset and the Spanish traditionalists. By the early 1930s his rejection of the abstract vapidity of class-ridden liberalism with its accent on internationalism and equalitarianism was as vehement as his reaffirmation of the old European values of nation, culture and personality. His showing was good in liberal Madrid, but not good enough. After the election he returned to private life, concentrating on his private law practice. He was often discouraged, and thought about emigrating to America. He spent much of his free time thinking about social and political questions, searching for an alternative to traditional conservatism and old-guard liberalism. He was particularly antagonistic to the political bosses and landlords of the provinces, to the privileges of the wealthy and to the Spanish Right, which tolerated these social injustices. José Antonio first publicly revealed his Fascist leanings in an article for a new weekly El Fascio, which the government confiscated before it appeared. This act of suppression reinforced his new political stance. He would dedicate the few remaining years of his short life to a Hispanicized National Socialism. Although aware of his talents, José Antonio thought that his intellectualism and his relationship to Primo de Rivera prevented him from becoming the Caudillo of Spanish Fascism. He knew that he was not a “man of the people” and declared that he “had too many intellectual preoccupations to be a leader of masses.” Yet he felt he must do what he could. During the spring of 1933 José Antonio began to build contacts with like-minded men, including the famous aviator Julio Ruiz de Alda, an ardent nationalist who distrusted the established parties. They quickly became close comrades. Together they distributed a considerable number of leaflets in Madrid and began to win converts to what José Antonio wanted to call the Movimiento Español Sindical. But Ruiz de Alda printed “FE” on the leaflets, which could stand for either Fascismo Español or Falange Española. On October 29, 1933, José Antonio launched the Falange Española at a political rally held at the Teatro Comedia in Madrid. Two thousand sympathizers, including Ramiro Ledesma, were present and many more heard the meeting on the radio. Three speeches were given, the high point being José Antonio’s heavily rhetorical and tensely poetic address, in which he denounced the “economic slavery” of the liberal state, the “materialistic” and “class struggle” dogma of socialism, and spoke for the “irrevocable unity of destiny” of the Spanish Patria, for “the deeper liberty of man,” and for “a system of authority, of hierarchy and of order.” Above all, he called for a “poetic movement” of struggle and sacrifice. Although the founding of the Falange Española was largely ignored by the establishment press, over a thousand members signed up in the first month. 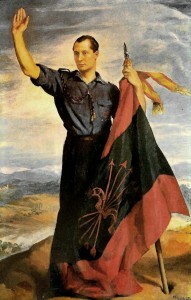 The Falange quickly overshadowed JONS as the Spanish movement of National Syndicalism. José Antonio won a seat in the Cortes, where he appeared only rarely. His impressive oratory, personal charm and handsome appearance were vital to winning the financial support and popular respect essential to the success of a political movement. On February 11, 1934, the leaders of JONS met and agreed to merge with the Falange, although still condemning what was termed “its reactionary features.” From then on, the Falange would be known as the Falange Española de las Juntas de Ofensiva National-Sindicalista—for short, “FE de las JONS.” The JONS’ slogans and emblems were adopted, and a troika of José Antonio, Ramiro Ledesma and Julio Ruiz de Alda took over the direction of the unified movement. Ledesma was gambling that the “social revolutionary” emphasis of JONS would triumph over the “reactionary-monarchist” elements within the Falange. He was more right than wrong. “Falange ideology henceforth took its esthetic tone from José Antonio and much of its practical content from Ramiro Ledesma” (Payne, p. 48). To celebrate the new unity, a rally was held on March 14, 1934, in Valladolid. More than three thousand raised their right arms as Falange leaders entered the hall. José Antonio again gave the main speech, stressing the differences that distinguished the Falange from other parties of both the Right and Left. As the meeting ended, a brawl broke out with some pistol-packing assailants outside. Although one Falange student died, the rally was declared a success. Actually, the fight provided a kind of baptism of fire for the newly unified movement. In late 1933, the Falangist weekly FE (Falange Española) appeared. Socialists put intense pressure on vendors to prevent sales, and fights were frequent, some resulting in death. Despite increasing violence, José Antonio ordered the Falange not to retaliate. Although he had stated that just ends justify violent means, he was against drawing the sword of political terrorism. Eventually, however, growing resentment against the movement’s passivity forced José Antonio to countenance violent reprisals, even though he never personally involved himself in such acts. Oppression by the Rightist government, and terror on the streets by the Left, dampened the Falange’s initial burst of growth. Party headquarters were regularly invaded by the police, FE vendors were eventually banned from the streets of Madrid, and Falangists were often arrested. In June 1934, José Antonio was called up for impeachment in the Cortes for unlawfully possessing firearms. Since most political leaders were either armed or had a bodyguard, the impeachment motion was nothing more than an effort by the Center-Right factions to silence him. He was saved by the help of a moderate socialist leader, who personally liked José Antonio and detested the underhanded methods being used to unseat him. In line with its program of “social justice” the Falange set up a workers’ organization, the Confederación de Obreros Nacional-Sindicalistas (CONS), in August 1934. A previous JONS association of Madrid taxi drivers became the first CONS syndicate. These syndicates began with only a few dozen members each, a rather limited membership compared to the massive trade union organizations like the powerful UGT and CNT, which exerted irresistible pressure on the Falangist workers. Unable to effect any significant benefits for its own members, CONS groups failed to have any impact on the tightly organized Spanish working class. Ridden by factions and under blistering attack from both the Left and the Right, the future of the Falange looked bleak in the summer of 1934. 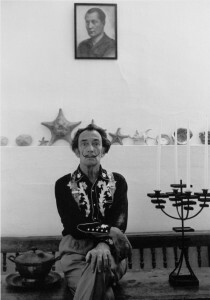 Nonetheless José Antonio’s personal power and popularity within the movement grew. The students idolized him. His physical courage, personal charm, vigor and eloquence made him the Caudillo despite his official position as only one triumvir among equals. Eventually his supporters started pushing for a jefatura unica, which would confirm him as party leader. In October 1934, the National Council of the Falange voted by the narrowest of margins, seventeen to sixteen, to establish an authoritarian structure with José Antonio as Jefe Nacional. In November the Falange issued a program of twenty-seven points written by Ledesma and modified and polished by José Antonio. This systematized statement of National Syndicalist principles was not really anything new, but the twenty-fifth point, dealing with the Church, kicked up a furor. It declared that while the Falange was faithfully Catholic, it would not allow the Church to interfere in its secular affairs. More than a few Falangists quit and went over to the Monarchist youth organization. Meanwhile Ledesma tried to persuade José Antonio to make an effort to win Leftist, working class and military support in preparation for an unspecified coup d’état. Knowing that the 5,000-member Falange was much too weak to become committed to such a foolhardy project, José Antonio stuck by his strategy of slow, organized, peaceful growth. Unconvinced, Ledesma sought to gather what support he could within the Falange to rebuild a “revolutionary” National Syndicalist movement. But the other leaders refused to go along and reaffirmed their loyalty to the Jefe. The Falange was now entirely José Antonio’s. Falange membership was divided into two parts: the “first line” active members; the “second line” passive collaborators. The most active component of the “first line” were in the Falangist Militia, a paramilitary group. At the beginning of 1935 the “first line” numbered no more than 5,000 and was concentrated largely in Madrid, Valladolid and Seville. By February 1936, “first line” membership had grown to 10,000, while the total number of Falangists was approximately 25,000, quite a gain over previous years but a mere drop in the bucket considering the size of rival Spanish political groups. A 1934 law preventing students from belonging to political parties kept large numbers of young men from joining the Falange. Most university students were organized in a Catholic association, with a socialist-liberal group next in size. Although a Falangist college organization never attracted more than a minority of students, they were the hardest-working and most determined of all Falangists. José Antonio’s principal stronghold of support was the University of Madrid, where he often gave speeches. Falange members were strikingly young, sixty to seventy percent of them under twenty-one. 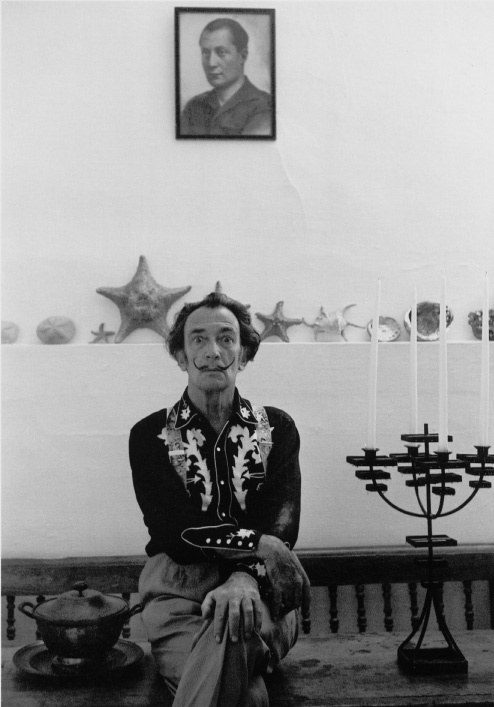 “They were a gay, sportive group, high-spirited, idealistic, little given to study, drunk on José Antonio’s rhetoric, and thirsting for direct action. Their only goal was an everlasting nationalist dynamism” (Payne, p. 83). The dynamism was supercharged with an impressive array of symbolism. Falangists wore blue shirts and sang the anthem “Cara al Sol.” They greeted each other with the Fascist salute, thundered their slogans at political get-togethers and painted Arriba España and España, Una, Grande y Libre on any wall they could find. As the elections of 1936 approached, the Falange faced a major dilemma: Should the movement cooperate with Rightist parties in a united National Front to oppose the Popular Front of the Left? José Antonio persuaded the National Council to agree to a united effort, but negotiations with Rightist groups showed that the Falange would be hurt more than helped by such cooperation. The Falange decided to go it alone. Falange candidates ran in nineteen districts, with José Antonio standing for election in Madrid and in six other regions. The party stressed land reform, the promotion of local industry and full employment. The election returns were disastrous. Not a single Falangist candidate won. In Madrid the Falange percentage of the vote was 1.19. In Cadiz, José Antonio received less than 7,000 votes. Nevertheless, in the two months following the election, the membership of the Falange probably doubled. As partisan violence increased, political, social and economic order in Spain disintegrated. On March 1, 1936, José Antonio ordered all university members to enlist in the Falange Militia. A few weeks later, activists organized an assassination attempt against an eminent socialist professor of law. The liberal government used this incident to outlaw the Falange on March 14. All leaders who could be found in Madrid were arrested, including José Antonio. “The[se] events of February and March, 1936, brought about the death of José-Antonio’s short-lived party, but they marked the beginning of a new process, bathed in blood and steeped in frustration, which was to make an enlarged, reorganized Falange into Spain’s partido del Estado” (Payne, p. 102). The success of the Popular Front in the February elections and the subsequent disorder in Spain signaled the organization of a military conspiracy by General Emilio Mola. Secret negotiations with the imprisoned José Antonio were begun in May. The prisoner, managing to reestablish the Falange chain of command through a system of messengers, ordered preparations for a violent move against the government. A new underground Falangist newspaper No Importa hurriedly replaced the banned Arriba. As some areas in Spain verged on social chaos, Spanish Nationalists began a definite swing toward Fascism. A private poll conducted in May by the clerical daily newspaper Ya showed José Antonio the readers’ first choice for president of the Republic. The government kept José Antonio in jail by inventing new charges against him and resorting to other forms of legal chicanery. On June 5, 1936, he was removed to the provincial jail at Alicante, while further arrests of Falangists made the party’s position desperate. When the chain of command again broke down, three-man cells were established to prevent further disorganization. José Antonio gave orders for the Falange to cooperate with the military in the event of a putsch or, if necessary, to prepare for an independent coup of its own. The outbreak of the Civil War on July 17 thrust an enormous responsibility on the Falange, since it was virtually the only Nationalist group capable of offering a dynamic alternative to the Monarchists and Traditionalists. “Membership increased enormously and soon passed all manageable proportions. As the first wave of emotion swept the Right, everyone hastened to put on blue shirts” (Payne, p. 121). The war and the influx of undisciplined members made control within the Falange extremely difficult, despite its reemergence from the underground in territories under the control of Franco. Manuel Hedilla, former provincial chief in Santander, acted as the surrogate for the imprisoned José Antonio. Pressure from the Left to bring the jailed Falangist leader to trial increased. In November he was hauled before a “people’s court” on charges of helping to foment the revolt against the Republic. He defended himself by pointing to his own anti-Rightist activities. Although the evidence against him was circumstantial and his final statement very moving, the sentence was a foregone conclusion. Shortly after dawn on November 20, 1936, José Antonio faced a firing squad. The death of its revered young leader was a serious blow to the Falange. The weakness of Manuel Hedilla, his successor, the hostility of the military and the general confusion of the times combined to severely weaken Falange independence and identity. On April 19, 1937, the Carlist and Falange parties were merged by order of Franco into the Falange Española Tradicionalista y de las Juntas de Ofensiva Nacional-Sindicalista. The awkward new title reflected the confusion of purpose and principles of what was now to be more “movement” than “doctrine.” The Generalissimo named himself Jefe Nacional. From then on, despite resistance by more principled and more “authentic” Falangists, the combined FET would be the one official political organization of Franco Spain. In using the Falange as an instrument of personal power, Franco betrayed the ideas, the goals and the legacy of José Antonio. Even though it served as a façade for the new Spanish state, falangismo as a living, breathing political force was dead. As if to make amends for what he had done, Franco established the cult of José Antonio. November 20 was declared a day of national mourning. Plaques commemorating him were set up in all Spanish churches. Schools and military units bore his name and the press and radio continued to refer to El Ausente (The Absent One). At the Civil War’s end a torchlight procession ceremoniously carried José Antonio’s remains three hundred miles to a grand and solemn burial at the resting place of Spain’s kings at El Escorial. The Patria is a total unity, in which all individuals and classes are integrated. It cannot be in the hands of the strongest class or of the best organized party. The Patria is a transcendent synthesis, an indivisible synthesis, with its own goals to fulfill—and we want this movement of today, and the state which it creates, to be an efficient, authoritarian instrument at the service of an indisputable unity, of that permanent unity, of that irrevocable unity that is the Patria. That all the people of Spain, however diverse they may be, feel in harmony with an irrevocable unity of destiny. That the political parties disappear. No one was ever born a member of a political party. . . . We were all born members of a family; we are all neighbors in a municipality; we all labor in the exercise of a profession. We want less liberal word-mongering and more respect for the deeper liberty of man. For one only respects the liberty of a man when he is esteemed, as we esteem him, as the bearer of eternal values . . . as the corporal substance of a soul capable of being damned and of being saved. . . .
We want Spain resolutely to recover the universal sense of her own culture and history. And we want one last thing. If in some cases this can only be achieved by violence, let us not balk at violence. But our movement will not be understood at all if it is believed to be only a manner of thinking [and not] a manner of being. . . . We must adopt [an] attitude [that] is the spirit of sacrifice and service, the ascetic and military sense of life. I believe the banner is raised. Now we are going to defend it gaily, poetically. The Spanish Falange firmly believes in Spain. Spain is not a territory, nor an aggregate of men and women. Spain is an entity, real in itself, which has performed world missions, and will have others still to perform. Hence Spain exists, first, as something distinct from each of the individuals, classes and groups that compose her. Secondly, as something higher than each of those individuals, classes and groups, or even than all of them put together. Accordingly Spain, which exists as a distinct and higher reality, is bound to have ends of her own. These ends are: continued existence in unity, resurgence of internal vitality and a preeminent share in the spiritual tasks of the world. . . .
A genuine state, such as the Falange wants, will not be based on the sham of the political parties, nor on the Parliament which they engender. It will be founded on the authentic realities of life: the family, the municipality, and the guild or syndicate. The ideology of José Antonio was partly rooted in the antiliberal, antidemocratic intellectual tradition that found widespread support in Europe during the 1920s and 1930s. He and his party members paid homage to Unamuno, Ortega y Gasset, Ángel Ganivet and Pío Baroja as “Precursors.” But despite similarities in style and principles, and even initial support from Unamuno, these Spanish intellectuals withheld their support from José Antonio. The concept of Spain as “a unit of destiny in the universal” was taken from Ortega. Pío Baroja, Spain’s foremost living novelist, had expressed antidemocratic, nationalist views, and Unamuno received José Antonio at his home. But a large part of the Falange leader’s social philosophy was not taken from Spanish sources at all. Rather, it grew out of the views of Nietzsche, Lenin, Spengler, Mussolini, Chamberlain and Hitler. “In October 1933, [José Antonio] paid Mussolini a visit, and returned to declare that Fascism was ‘a total, universal, interpretation of life’” (Richard A. H. Robinson, The Origin of Franco Spain, p. 98). A year later, however, in response to rumors that he would attend an International Fascist Congress in Switzerland, José Antonio repudiated his ties to Italian and other “imported” ideology by declaring that he had “flatly turned down the invitation in order to make clear the genuinely national character of the movement, which has no intention of giving the appearance of possessing an international leadership. Moreover, the Falange Española de las JONS is not a Fascist movement” (Charles F. Delzell, Mediterranean Fascism, 1970, p. 263). José Antonio often stressed far-reaching economic reforms. The Falange would nationalize banking and credit, guarantee employment, redistribute land and make higher education free. At the same time, private property was to be respected. By the “corporate state” and “syndicalism” José Antonio meant the organization of “Spanish society corporatively through a system of vertical syndicates for the various fields of production, all working toward national economic unity” (Payne, p. 79). In sum, he wanted broad state economic planning and guidance of national production, but not state ownership of the means of production. We are witnessing a struggle between the Christian, Western, Spanish, individualistic concept of life, with all that it implies in the field of service and self-sacrifice, and an irreligious, materialistic Russian concept. If the latter should triumph in Spain, large tracts of our country—Catalonia, the Basque Provinces, Galicia—would break away and submit to the Soviet. We are now in the inept hands of sick men, who out of pure resentment might be capable of handing us over to dissolution and chaos. The Spanish Falange summons all—students, intellectuals, workmen, army officers—to the happy and dangerous task of recapturing our lost heritage. The phenomenon of José Antonio and the Falange was not unique to Spain. It was part of the European response to the failure both of traditional and capitalist conservatism and of parliamentary, laissez-faire democratic liberalism. European Fascism was the successor to the nationalistic concept of la Patrie born in the French Revolution. It also succeeded the liberal eighteenth- and nineteenth-century concepts of social integration. The dynamics of economic development (rise of large corporations and organized labor) and of political development (rise of the modern state) helped force thinking in terms of the community. World War I was a strong factor in bringing an end in Europe to the “rationalist” concept of irreversible “progress.” The 1920s and 1930s saw the breakdown in the spiritual power of organized religion. At the same time, there grew up a new mythos, either around the Patria, Fatherland and Nation or, in the case of the Marxists, around the Proletariat. Fascism represented the synthesis of the most dynamic movements of recent European history—Nationalism and Socialism. To put Spanish Falangism in a proper perspective, we must remember that Fascism in the 1920s and 1930s had become the state ideology of Italy, Germany, Hungary, Rumania, Poland, the Baltic states, Austria and Spain. In its early stages World War II spread Fascism even more widely. But then in 1945 came the triumph of Anglo-American Democracy and Soviet Communism. In Spain a watered-down version of Fascism continued into the 1970s, but the realization of José Antonio’s political and social goals was made impossible by the European holocaust. In post-Civil War Spain it was not the movement which directed the state, as José Antonio had intended, but the state which directed the movement. Franco’s Falange became a sterile appendage to the state bureaucracy. The memory of José Antonio, however, has not been totally eradicated from the Spanish mind. On one level, it is demonstrated in a state-sponsored cult designed to give poetic, intellectual and ideological attractiveness to an essentially traditionalist and uninspiring regime. On another level, there exists in Spain today tens of thousands of Spaniards, most of them quite young, who honor the great days of the Falange and work for a post-Franco Spain based on Falangist principles. They have formed into two groups: the Fuerza Nueva and the Círculo Español de Amigos de Europa (CEDADE). The recent chaos in Portugal has strengthened the conviction of Spanish Fascists that the only long-term alternative to a Communist Iberia is a form of National Socialism. But whereas in the 1930s nations like Germany and Italy could give aid to the Falangists, today the successors of José Antonio have only their own strength to rely on—that and the intellectual and spiritual legacy of their Founding Father. Source: Instauration, December 1976, pp. 9, 18–22.